Tech in Motion DC is back with another round of Demos and Drinks! Join us on the evening of Tuesday, February 24th ﻿in downtown DC for drinks, networking, and interactive demos from local companies, including Yapper, a mobile app that allows users to have group conversations with the people around them. "Yapper facilitates conversations at local events or within the community, in real time. 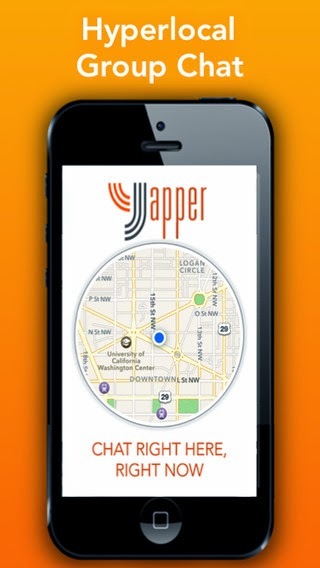 A Yapper 'chat room' automatically appears at the location of every event in DC (integrated with EventBrite, Meetup, StubHub) which allows attendees to text with one another solely based on location and connect in ways not previously possible. Yapper also allows every user to create their own conversations (ie. "Anyone going to HH nearby?") and broadcast those chats to everyone nearby. Make sure to Download Yapper before you get to this event to interact with other attendees."